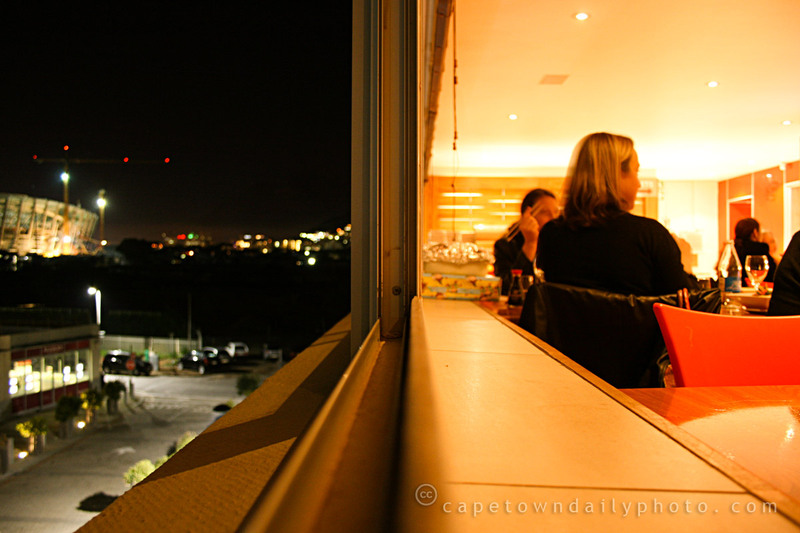 At least one of our UK readers in particular will immediately recognise the inside of Wakame, a popular tapas and sushi restaurant in Mouille Point, located very close to the Green Point soccer stadium. In fact, the stadium is precisely what you can see brighly lit out in the darkness. While we were enjoying really (very) good sushi, I watched welding sparks dropping to the ground from the structure in the distance. It would seem the stadium's construction workers are putting in some serious overtime to catch up after last week's wage dispute. Posted in Activities, News and tagged 2010 world cup, construction, green point, restaurant on Friday, 17 July, 2009 by Paul. Well we are pleased to see this photo!! Glad you’re keeping it going for us so that it’ll be there for us on our return!! Dear Paul and Kerry Anne, I so enjoyed your wonderful work. Today, I’ve been coming back again and again to look further. This was a wonderful idea and a Gift to those who visit. I wrote you a message today via email with a request. Look forward to hearing from you. Hi Debbe, thanks for your message – I’m glad that you’ve enjoyed our site. I don’t think I’ve received mail from you though.